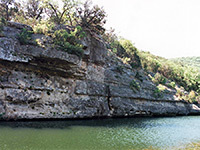 Deep, branched limestone canyons with clear running water provide the main attractions of Lost Maples State Natural Area, plus for those interested in trees there are several groves of Canadian bigtooth maple, a species usually found much further north or west. Once when Texas was wetter and less hot these trees were widespread over the hilly land around San Antonio but they now survive in only a few sheltered canyons that harbour a moist microclimate, rather different to the prevailing dry conditions. The colors of the foliage are particularly striking during the fall. Lost Maples is quite isolated, set in an empty region of large cattle ranches; to the north and east the few approach roads pass through generally flat land with scattered cacti, bushes and boulders, at the edge of the great plains that stretch westwards for hundreds of miles. South of the park the land breaks up into a series of steep wooded canyons and plateaus, part of the Texas Hill Country. The entrance is along the little used Ranch Road 187 between Vanderpool and the only slightly busier TX 39 that links Kerrville with US 83. Maple Trail - a short level path through wooded clearings at one side of the Sabinal River past many large maple trees, then returning back via a more sunny route on the opposite side. East Trail - a 4.6 mile loop along Can Creek, the largest tributary, which has several small lakes with steep cliffs at one side, then steeply up 300 feet to the flat lands above the canyon, across the scrub-covered plateau for 1 mile then back south along the Sabinal River. West Trail - another loop (4.1 miles), also along Can Creek but continuing further upstream, then south across hilly land and eventually back down the canyon of another tributary canyon and rejoining the East Trail, 0.4 miles from the main river. The park is rather tame and gentle, with easy, mostly level paths through pretty, sheltered glades filled with shadows and much greenery. It is popular for bird watching, nature study and fishing as well as just strolling through the trees. The peaceful atmosphere is only occasionally disturbed by violent flash floods that sometimes rush down the canyons. 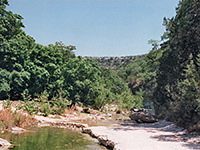 The nearest places with hotels close to Lost Maples State Natural Area are Fredericksburg (76 miles), Hondo (50 miles), Kerrville (50 miles), Segovia (70 miles) and Uvalde (60 miles).